LA restaurant tweets Customer’s names that are no shows – The Beverly Hills restaurant is now publicly shaming people who “no-show” reservations by tweeting and Facebooking the names of offending Customers. 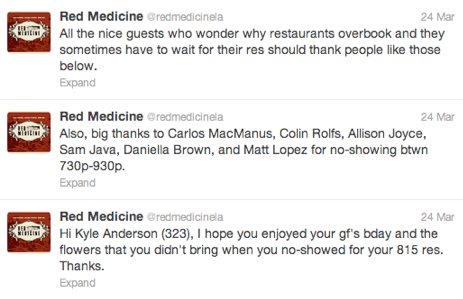 Red Medicine tweeted the full names of people who failed to show for their reservation. “Hi Kyle Anderson (323), I hope you enjoyed your gf’s bday and the flowers that you didn’t bring when you no-showed for your 815 res. Thanks,” snarked one tweet. Brand Assassination – While it is frustrating to have Customers who “no show” prime appointments and the business loses sales as a result, (i.e. I know this first hand…John Robert’s Spa), shaming your Customers is not the answer. There are numerous other better approaches, i.e. taking a credit card for a guarantee. 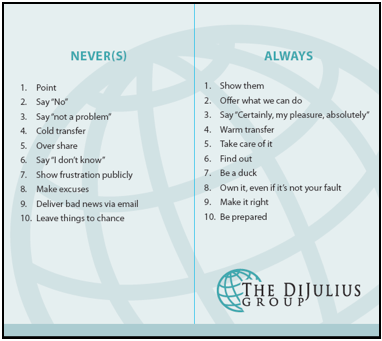 No problem is a Big problem – The biggest street slang terms used in every business today are the responses, “no problem” or “not a problem.” With all of our consulting clients, we help create their Never & Always list, and 100% of the time, “not a problem” is on the Never list and certainly, “my pleasure,” and “absolutely” are on the Always list as alternatives. Using “certainly” or “my pleasure” is so much more professional than the often heard, “not a problem.” It elevates the professionalism of your employees’ terminology. It starts establishing a culture of hospitality, where the Customer is first. I recently read a great blog by Joe Schumacker, No problem, Big problem (read the entire short blog) that articulated this really well. “No Problem” is a problem on two levels. The “No Problem” auto-response places the staff member’s comfort ahead of service to the Customer. Expanding the auto-response for full meaning, “No Problem” becomes; “You are not creating a problem for me”. As a Customer I want to feel that my interests are first and foremost in the mind of the staff member, not that I may have inconvenienced a staff member by being a Customer. The second problem with “No Problem” is that it consists of two negative words. When I first read the Onstar story it reminded me of the employee that was not allowed to to perform CPR because of corporate policy. However I took the time to read the blog that it orginiated from and the subsequent followup from Onstar with Vanessa, the mother in the story. I enjoy reading your Blog and always get a lot out of it, but in this case I think it would only be fair to share the follow up as well.